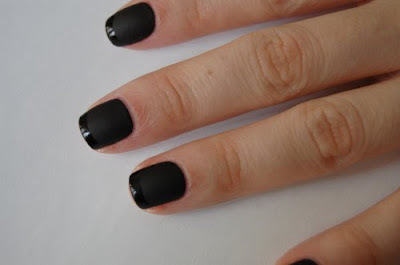 Matte nail polish seems to be in this season. The jury is still out on how I feel about it. What I am loving is that I don't need to go buy a whole new set of nail polish- I can just get a matte top coat and use the same colors I already have, score! This hip version of a french manicure just might be the way to ease into the whole matte thing. I may be rockin' this look the next time I go in for a manicure. LOVE it!! Tell me, do you go matte? I'd love to try the look but haven't seen the products. Where can you find Essie? Is it only at salons? (I'm more of a drugstore nail polish kind of gal). 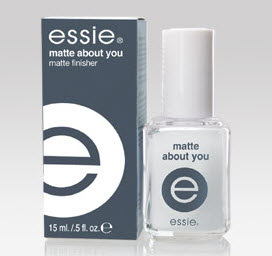 I'm loving the matte look and can't believe I hadn't heard about that Essie product yet!! THANK YOU! I think I would do that killer tone-on-tone french manicure in a grey. I'm a bit afraid of black on my fingers. Ooh, maybe the bronze I have on my toes would be good! I'm a polish traditionalist, I suppose - I stick to the glossies! Had never seen this...where have I been? I like it! Thanks for the heads up about that Essie product! Didn't know that was out there! Love it! Yes, I just bought the Essie top coat the other day and I am in LOVE! I painted it over dark purple & it was amazing! Oh and I got mine at Trade Secret for about $7. Not really a fan of the matte look, but I do like that cool updated french mani! WOW. That black frenchie is awesome! I do love the matte look. Awesome that you found that product from Essie! Laura- you can get it at the salons, even if you dont get a manicure there. Also like Jessica said they have it at the mall salon places like Trade Secret. Very cool nails. I will have to check into having mine done that way. Thanks! matte polish is so cool, but never saw it will gloss-shiny. even better! Ditto on what everybody wrote, Haven't seen this either! Looks very cool though. I always go the traditional White french. i like the look but i'm way too rough on my manicures to ever even try it. I haven't tried it yet, but have heard that it is fun...do you have any suggestions for some fall colors?